On February 8, over 300 students from at least five high schools including Skyline High and Oakland Tech marched on the school district headquarters chanting “Oakland Schools United will Never be Defeated.” Over 5,000 thousand students likely stayed home. 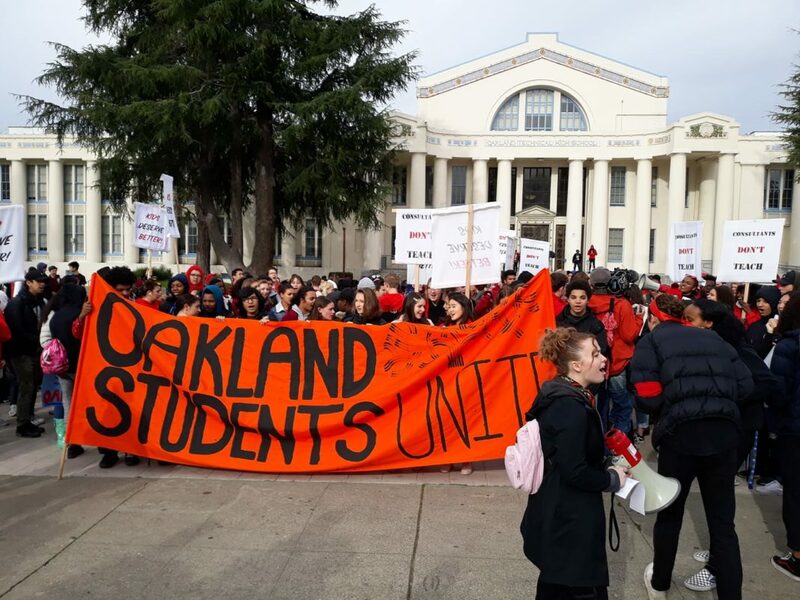 Students rallied in front of Oakland Tech, taking inspiration from their teachers and the success of the recent teachers’ wildcat strike which used the same approach. Students carried OEA union pickets and chanted slogans in support of their teachers. The students are prepared to defend their schools, their teachers, and their futures, which are all under attack from the billionaire backed Oakland Unified School Board. 95% of Oakland Teachers voted to authorize the strike last Friday with 84% of teachers voting. This is more than three times the turnout compared to their last strike authorization vote and the highest support for a strike in the union’s history. The district is trying to divide students and parents against the teachers. They’re going to say teachers are greedy for asking for more than poverty wages and not looking at the whole picture when they fight to keep our schools open. They want us to make cuts now so that sometime in the future teachers can get a raise and classroom sizes can go down. They’ve already made robo-calls to the parents of students who’ve received charity scholarships that if they “miss” class during a strike their funding could be revoked. The LA teachers faced a similar attack in which they forced the district to recant. No days of absence were recorded for LA students during their recent victorious strike. The strongest defence against these divisive tactics was demonstrated today by the students marching in solidarity with the teachers. If students and parents join the teachers’ picket lines that creates a unified defence, undermining district attempts to implement cuts. The stronger the community is behind the teachers the shorter the strike will be. Additionally, the school board is threatening to close over 20 schools, starting with Roots International Academy, which they voted to close last week. And they now have their sights on Kaiser Elementary. They want to close the gap in the budget by closing our schools and handing them over to privately-run billionaire-backed charter schools. The district is telling us that the approximately $30 million surplus from 2017 has now become a $30 million deficit in 2018. Oakland classrooms and teachers sure haven’t seen that money. New teachers are paid over $10,000 less than surrounding districts, classrooms are packed, and books and supplies are ancient. So where is the money going? And why should teachers and students be the ones paying for the deficit? We should be cutting the bloated administrator salaries and taxing the rich to fund our schools. California and the Bay Area has one of the highest concentrations of billionaires on the planet with over 144 billionaires in the state, many of them in our backyard. We should be taxing them. Parents played a supporting role in the walkout and march, managing traffic as the students took over Broadway, one of the major arteries of Oakland, blocking all southbound traffic. The district is trying to undermine the strike in any way it can. It’s offering $300 a day for unqualified and untested substitute “teachers” to scab on their communities. Teachers are incensed. The district clearly has money to attack teachers, why not use that money to buy supplies and pay real teachers? Regular substitutes are members of OEA which has organized an emergency picket of the districts hiring event. The district is also attacking and making cuts to the school workers in SEIU as well. If teachers can’t work, neither can janitors, cafeteria workers, or support staff for special needs children. SEIU is organizing a rally at the school board and is prepared to go on solidarity strike with the teachers. Preparations for the strike continue across the city. Teachers and parents are organizing to stop anybody from crossing the picket lines once the strike starts. “Our school is prepared to not let a single person past the picket lines” one parent was telling me at the walkout. Some schools have a meeting planned after the first day of striking to regroup and assess. As certain schools take the lead in organizing other schools should be looking to them as an example. The better organized each school is the better they’ll be able to fight. Social media has played a vital role in allowing teachers, parents, and the community to quickly communicate and discuss events as they unfold. This was critical in LA with the facebook group Parents Supporting Teachers, and has been taken up in Oakland with the private Facebook group “Oakland Parents Supporting Teachers / Familias de Oakland Apoyando Maestros.” If you aren’t a member, ask a teacher or parent to invite you. Socialist Alternative and the Democratic Socialists of America have helped organize house parties of parents, teachers, students, community members, and socialists. These are an excellent way to build solidarity for the strike and raise funds for the teachers. At Socialist Alternative’s recent fundraiser upwards of $5,000 was raised including a $500 donation from Kshama Sawant’s (a socialist Seattle city councilmember) solidarity fund and a donation from rapper and director of Sorry to Bother You, Boots Riley. Keep Roots and Kaiser open! No school closures. Tax the Rich and Chop from the Top. $15,000 raise for new teachers. Lower Class Sizes: 20-1 ratio for lower grades, 25-1 for higher grades. End the billionaires’ attacks on public education. No to privatisation. A California Billionaire Tax now.